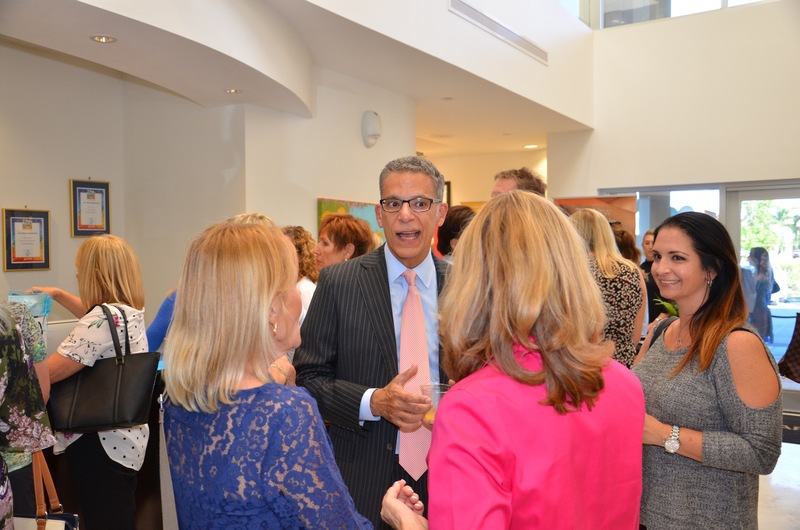 Dr. Ralph Garramone is a leading Southwest Florida plastic surgeon who specializes in all facets of plastic surgery including breast augmentation, Liposuction and tummy tucks, as well as nonsurgical procedures. The practice, located in Fort Myers has been the recipient of numerous awards, including Dr. Garramone being recognized as one of America’s Top Doctors in plastic surgery for ten years in a row by Castle Connolly Medical Ltd. For the past several years, Southwest Florida has seen an abundance of plastic surgeons and has witnessed an explosion of medispas opening in the region, signaling the field is continuing to grow more and more competitive. Garramone Plastic Surgery had been steadily leading the market and did not want to become commonplace. The practice was ready to evolve its brand to help them surpass the competition. In March 2017, they contacted the Agency to develop a campaign to increase their marketing presence and position the practice as the authority on breast augmentation, Liposuction and CoolSculpting®, as well as medical-grade aesthetic treatments. 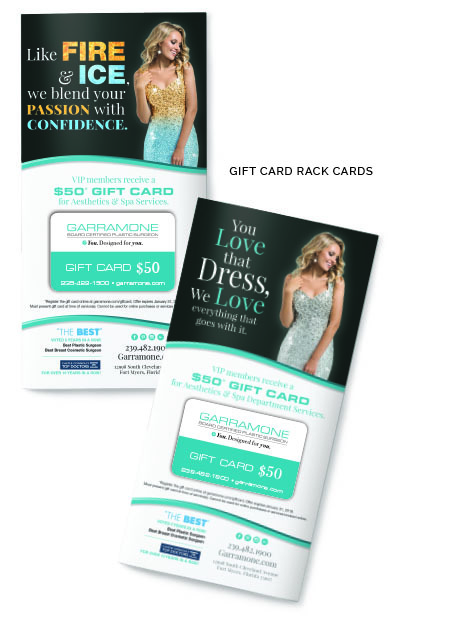 Garramone Plastic Surgery was open to taking risks in promoting their brand, but wanted to maintain the classiness they had established over the years. 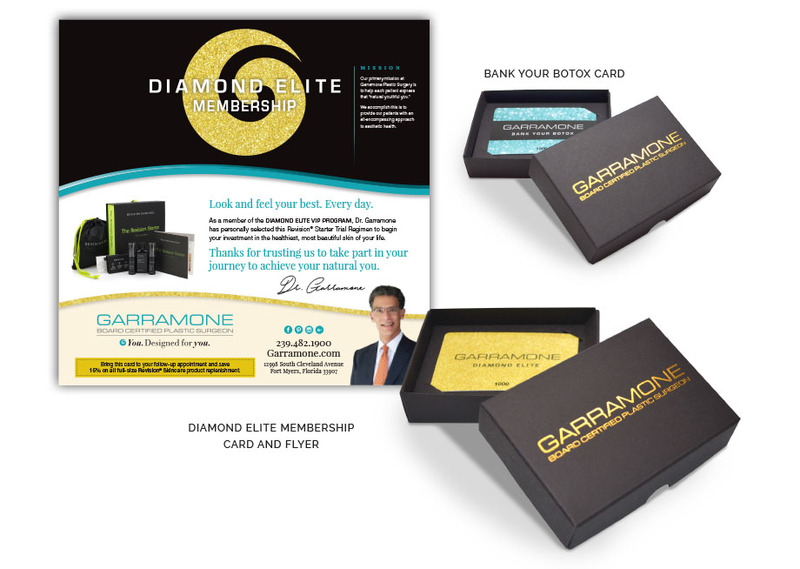 The Agency was very excited about taking on the challenge of evolving the Garramone Plastic Surgery brand. The Brand Architects™ kicked off the campaign with a unique creative strategy that included a modified logo and the development of a new positioning line. Staying true to the sophistication of the Garramone name, our design pros softened the appearance of the logo with font and styling, while incorporating a contemporary color scheme to create a representation that is elegant, timeless and classic. Taking into consideration that people choose surgical enhancements for a variety of reasons and that procedures vary based on the desired result, the creative team developed a new positioning line that supported the concept of customization, in order to match how each individual feels and wants to feel. The positioning line that best fit this concept was: You. Designed for you. Next, the Agency collaborated with the Client to create a schedule for the campaign rollout. Incorporating our creative strategy, we developed assets for use in e-Blasts, brochures, print ads, digital billboard ads and social media ads, as well as marketing support and materials for events. The Agency implemented a social media strategy that targeted a custom Facebook audience including a lookalike audience. 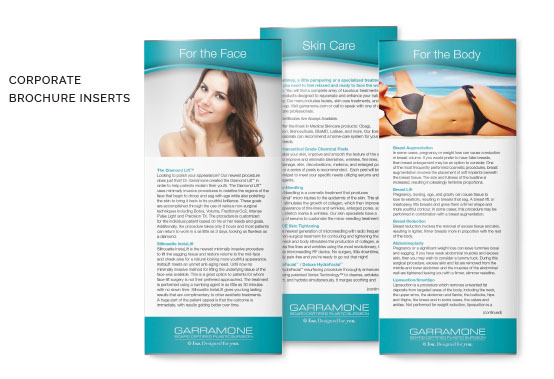 Through paid ads, the Agency set out to increase traffic to the Garramone Plastic Surgery website, as well as drive business to the practice. Ads were modeled after events, print ads and e-Blasts, as continuity and consistency is key to any successful marketing campaign. 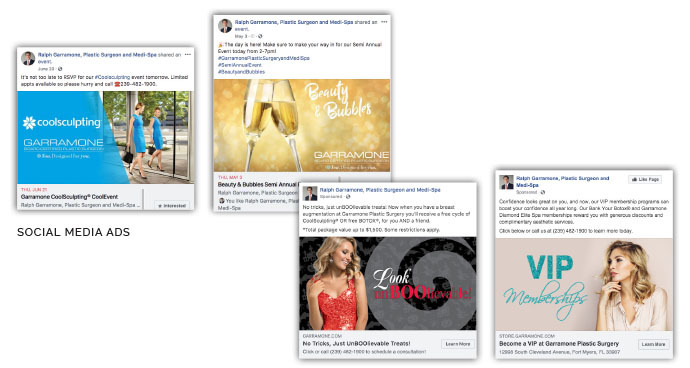 In conjunction with the Agency’s efforts, the Garramone team continued to post staff-related and business-related news and videos to increase reach and engage followers. 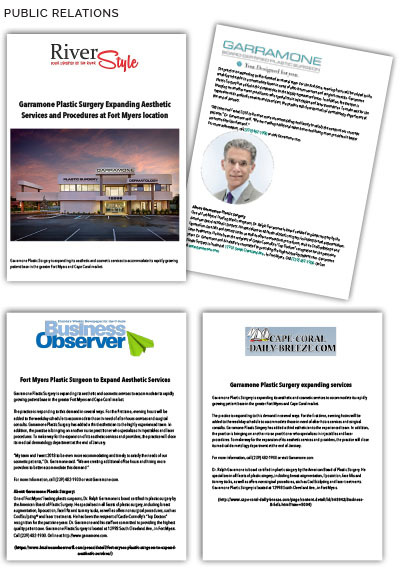 To round out our efforts, the Agency capitalized on digital and print paid media opportunities that reached a broad target audience with a goal of driving more clients to the practice. The digital platform included search engine marketing (SEM) ads and behavioral and retargeted banner ads. On the print side, ads ran on a consistent basis in Grandeur, Gulfshore Life, and Parent & Child, as well as in special editions such as The News-Press and Florida Weekly “Best Of” and Gulfshore Life’s Who’s Who in Health. 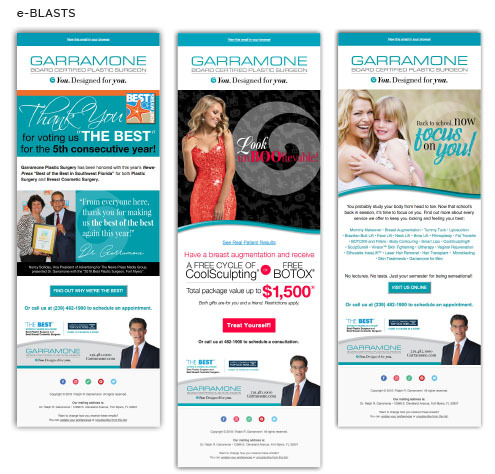 For campaign elements not fulfilled with paid media, e-Blasts and flyers, the Agency looked to earned media opportunities and developed a public relations strategy that included press releases and feature story pitches that promoted the Garramone Plastic Surgery brand. 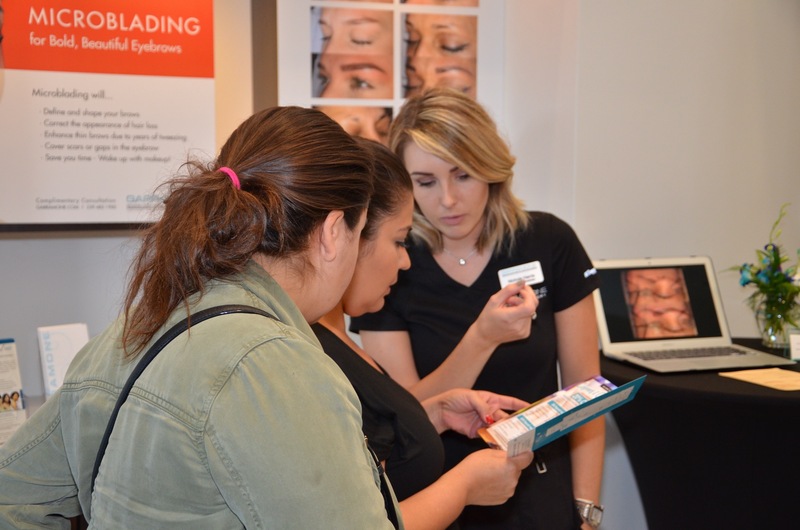 Topics ranged from new hires, awards and events to state-of-the-art equipment and procedures the practice performs. Media outlets were presented with opportunities to interview Dr. Garramone and his staff in person or via telephone, as well as given the opportunity to tour the practice. 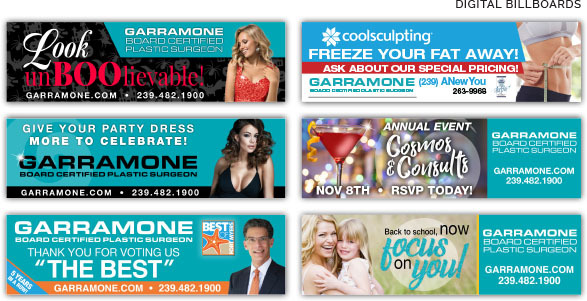 On top of the public relations efforts, the Agency also provided marketing and promotional support for the many events held at Garramone Plastic Surgery, such as the annual “Cosmos & Consults” and the semiannual “Beauty & Bubbles” events. Lastly, the Agency developed a long form video highlighting Garramone Plastic Surgery and the services they provide. The video is coming soon and will include interviews with Dr. Garramone and the practitioners, as well as patient testimonials. B-roll footage will include demonstrations of specific services being performed with an overview about each procedure and the benefits each provides. The long form video will also run on social media and the website to illustrate each service. Spiro & Associates has successfully established an effective brand campaign that has generated tremendous results. Call volume and website visits have increased exponentially, with new patient visits to the practice increasing. Social media has performed well with Facebook followers increasing by 44.5%. Page likes have also increased by 40%, and since implementing the Facebook lookalike audience, the average click-through rate has increased 2.21%. Overall, paid ads have averaged a 1.56% click-through rate, performing well above the industry average. e-Blasts have performed equally well, generating open rates ranging from 12 -18% per e-Blast, which is well above the industry average of 11%. 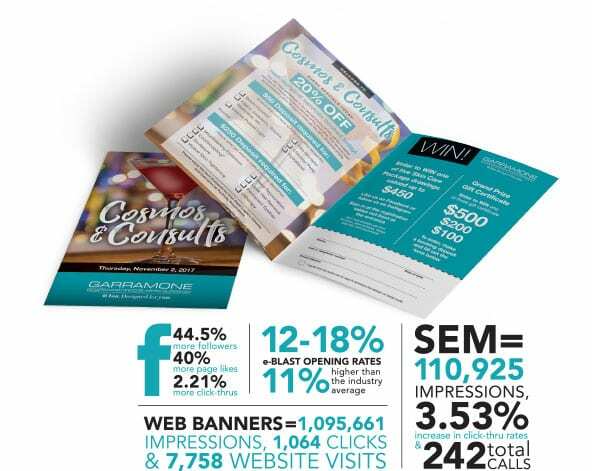 Banner advertising produced 1,095,661 impressions, 1,064 clicks and 7,758 website visits, while SEM delivered 110,925 impressions, a click-through rate of 3.53% and generated 242 total calls. 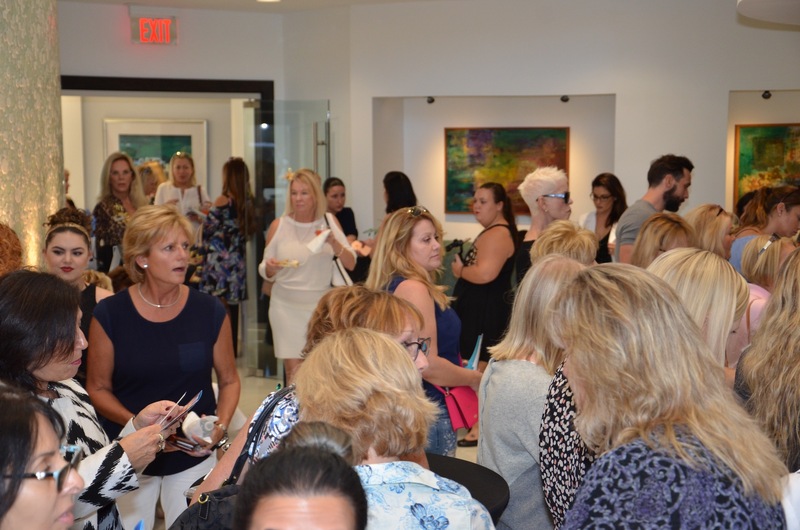 Special events supported by the Agency, such as “Beauty & Bubbles” generated an overwhelming response and brought in a substantial volume in new business to the practice.